You can’t walk ten feet in any electronics store without running into another Bluetooth speaker. They come in so many varieties, colors, shapes, and price ranges that it is confusing trying to figure out what’s good or bad. The LuguLake Portable Wireless Bluetooth Speaker is good, with a few caveats. 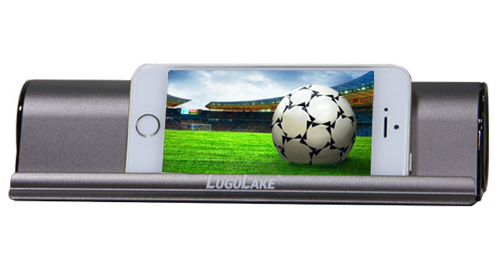 The LuguLake has a built-in stand for your iPad (or any tablet or phone) that works very well. I tested the unit with an iPad Air 2, and even with a slim iPad case, it fit in very well. When the iPad is in the stand, you cannot see the speaker, as it sits behind the iPad. That does not take away from the audio, and gives the speaker a small form factor. Audio quality is good. I was not expecting it to sound as good as it does. While there are better sounding Bluetooth speakers on the market, few sound this good at this price-point, and almost none have a build-in stand for your iPad. The stand sets this speaker apart from the competition. Bluetooth pairing was simple, and required almost no effort. You can also plug your music player directly into the LuguLake Portable Wireless Bluetooth Speaker via the 3.5mm Auxiliary input. It even comes with an 3.5 mm audio cable. The LuguLake is a stereo speaker, not mono, and with the speakers on each end, sitting behind the iPad, it does a good job of separation. The build-in rechargeable battery has ample charge time. I used it for over six hours before the battery died. It does charge quickly, from dead to fully charged in less than four hours. The two negatives: the Bluetooth receiver tends to pick up too much interference, causing a hissing sound. This does not always happen, but tells me that either a very inexpensive BT Receiver was used, or it does not have adequate shielding to keep out unwanted interference. The other negative is a constant blue light blinking while in operation. The light is in the rear, but is bright enough to be annoying. I have no idea what is the rationale for making this light blink during operation, and a small piece of black tape fixed the problem. Still, it was not a smart design choice on any level. 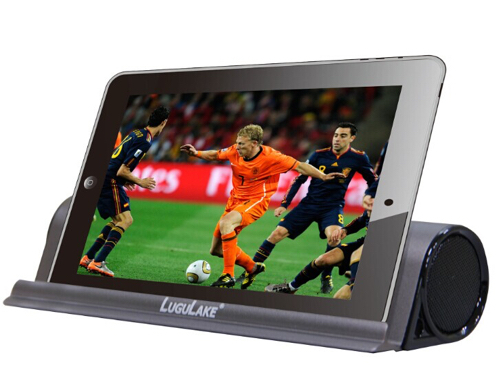 All that being said, I like the LuguLake Portable Wireless Bluetooth Speaker.